Home > Shop By Brand > BLACKFIRE Pro Detailers Choice Car Care Products > BLACKFIRE Synthetic Clay Mitt Cleaner - Coming Soon! BLACKFIRE Synthetic Clay Mitt Cleaner - Coming Soon! Make sure your decontamination step is not a re-contamination step! BLACKFIRE Synthetic Clay Mitt Cleaner will effortlessly separate all the contamination from your synthetic clay mitt and leave it clean and ready for your next decontamination. BLACKFIRE Synthetic Clay Mitt Cleaner makes claying your car much safer than it has been in the past! With BLACKFIRE Synthetic Clay Mitt Cleaner you won’t having to worry about all the contamination in your clay mitt potentially marring the surface of your paint during the claying process. Keeping your mitt clean with BLACKFIRE Synthetic Clay Mitt Cleaner will allow you to get many more cars out of every mitt you use! Whether you call it “decontaminating your paint” or “claying the surface”, it is one of the most important process in car detailing. By simply existing, you paint is bombarded with a slew of contaminants and debris that stick into your paint on a microscopic level. These contaminants leave the surface dull and rough to the touch. Not only that, but most of these contaminants will eventually erode away your car’s precious paint, causing permanent damage. You can solve this issue by simply claying your car with a synthetic clay mitt. However, that contamination doesn’t just disappear, it remains stuck in your mitt. 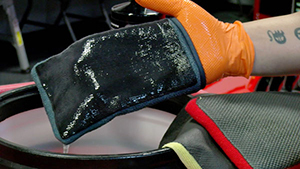 Because synthetic clay mitts were designed to be used often and for plenty of cars, having them riddled with contamination poses some serious risks! BLACKFIRE Synthetic Clay Mitt Cleaner is easily applied. Just spray on your mitt! This is precisely why BLACKFIRE Synthetic Clay Mitt Cleaner was created! BLACKFIRE Synthetic Clay Mitt Cleaner contains revolutionary surfactants that will work quickly to separate the contaminants from your synthetic clay mitt, making them easy to scrub or rinse away. 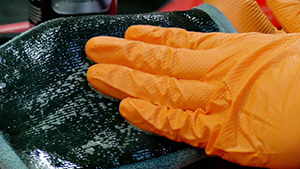 The surface of your mitt that is left afterwards will be contaminant-free and ready for the next safe and effective decontamination step! 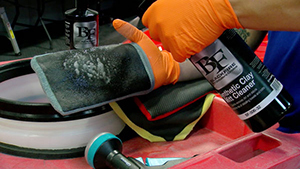 While your paint’s safety is probably the most important thing to you, it is not the only benefit of routinely using BLACKFIRE Synthetic Clay Mitt Cleaner during your claying process. Synthetic clay mitts by nature are meant to be a long-term alternative to traditional clay bars. Because clay bars break down quickly, you will find yourself going through many of them through out your detailing career. Synthetic clay mitts are able to last 10 times as long as tradition clay, but they too will eventually fall victim to the abuse! Agitate your mitt and rinse! However, using BLACKFIRE Synthetic Clay Mitt Cleaner to clean the surface of your mitt regularly will greatly reduce the amount of abuse your mitt sees! 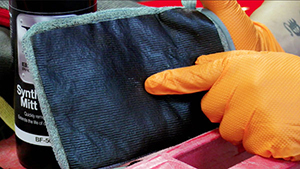 Because you don’t have to worry about the microscopic contaminants tearing your mitt to shreds as you use it, you’ll get even more cars out of it than before! Working out of direct sunlight, spray Synthetic Clay Mitt Cleaner directly onto the affected area and allow to dwell for approximately 30-45 seconds. Scrub the surface using a brush or by agitating the towel or mitt. Rinse thoroughly with water and dry. Stay tuned - this item will be available soon! Blackfire Power Pack - FREE With BLACKFIRE Orders over $50!BLACKFIRE Car Dryer - FREE SHIPPING + FREE GIFTLimited Edition BLACKFIRE Ultimate Complete Bucket KitBLACKFIRE Detailer's BagBLACKFIRE Car Care KitsWet-Ice Over Fire – A Different Kind of ShineBLACKFIRE Garage Banner, 14 x 55 inchesBLACKFIRE Pro Ceramic Coating Wash 32 oz.BLACKFIRE Complete Coating Maintenance KitBLACKFIRE Compound 8 oz.BLACKFIRE Polish 8 oz.BLACKFIRE Paint Sealant 32 oz.BLACKFIRE BlackICE Hybrid Montan Sealant WaxBLACKFIRE BlackICE Hybrid Montan Sealant Wax 3 oz.BLACKFIRE Car Wash 32 oz.BLACKFIRE Wash & Wax 32 oz.BLACKFIRE Foam Soap 32 oz.BLACKFIRE Foam Booster 16 oz.BLACKFIRE Midnight Sun Ivory Carnauba Paste Wax 7.4 oz.BLACKFIRE Midnight Sun Ivory Carnauba Paste Wax 3 oz.